Depression, anxiety, and bipolar disorder are hard. MoodTracker.com is a simple web app that lets you track important health measurements like depression and anxiety levels, sleep, water intake, and many others -- each recorded on a vibrant chart. The app also includes medication tracking, reminders, and the ability to share your charts with members of your wellness team. How does it work? Seeing your behavior patterns can inspire life changing actions. Really? 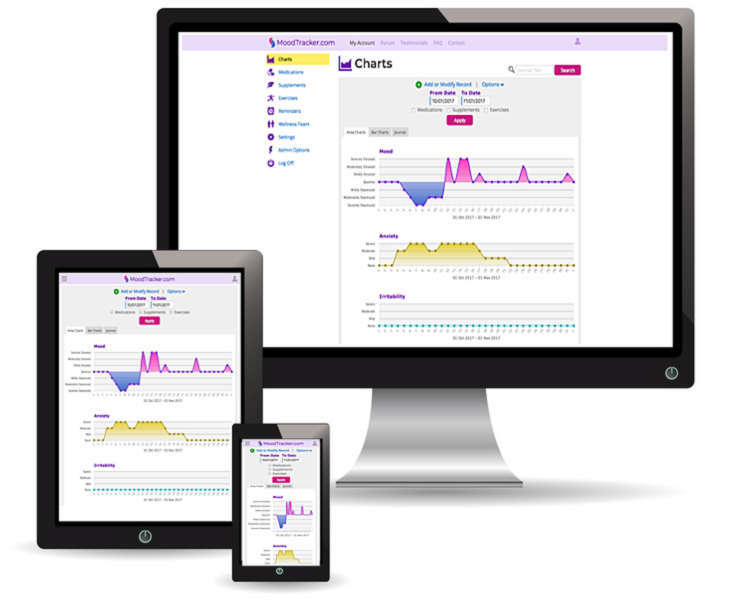 Charts Any health measurement you want to track can be tracked and displayed on the graphical charts. Over time you'll be able to see patterns emerge that can help you identify what works and doesn't work. The length of time shown on the charts can be adjusted to any date range. Public Forum Our forum is a place where you can talk to other like minded people who have a keen interest in their health and wellbeing. It's a friendly community where sympathy and compassion can be found. Treatment Tracking Keep track of your Medications, Supplements, and Exercises. Any change in treatment can be tracked so you have a complete history. When these are shown against your charts, you can see if a treatment change had a positive or negative effect. Reminders With Reminders you can schedule text messages or emails to be sent to you on a regular basis to remind you to take your medications or to remind you to record your mood. You can even reply to text message reminders to record anything you're tracking. Wellness Team Because your charts and treatments are online, it's easy to give others access. Those who care about you the most can take a more active role in helping you reach your wellness goals. Upgrade Options One of the best features of having an upgraded account is you get powerful bar charts that can help you identify which treatments work best for you. This is just one of many features that come with a paid subscription. Check out our features and subscription plans now! "I just wanted to tell you how happy I am that you have made this mood tracker available to use online. It is wonderful... This is the easiest way of doing it that I have ever come across. Thanks." News Article: BYU research: Mental health apps are a cheap, effective self-help tool. Study Report: Mental and Emotional Self-Help Technology Apps: Cross-Sectional Study of Theory, Technology, and Mental Health Behaviors.